When I visualize iridescence, I see butterfly wings, humming, birds, scarab beetles and red algae. Did I lose you at red algae? I promise you that several marine algae have an outer glow not attributed to visiting a tanning salon. 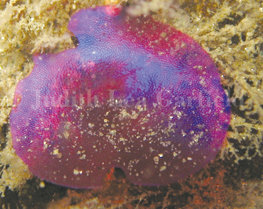 One such species, Fauchea laciniata, is found in the San Diego-La Jolla Underwater Park. The color of this alga arises from accessory photosynthetic pigments (phycoerythrin, phycocyanin, allophycocyanin) and, depending on the relative amounts of each (and chlorophyll), plant color varies. F. laciniata is deep red with wide, branching blades and an overall shape like that of a flattened rosette. It anchors itself to rock or other hard substrate by a short holdfast. The mechanism behind iridescence is a phenomenon called “thin-layer interference.” Here's how it works: whether we talk about water or light, waves are involved; the former have white caps and the latter have wavelengths. Water waves can interfere with each other, like when there is high tide off the Marine Room. An incoming wave bashes into the restaurant's windows, then bounces back, only to smack into the next incoming wave. The so-called reflective wave slams into the incoming wave, generating a wave with a taller crest and a deeper trough then either wave could individually. Light, too, makes waves, and they are all around us. However, these various waves (wavelengths) don't interact with each other like water waves. Instead, light waves are transformed when they strike anything solid or liquid — in other words, anything that forces them to change direction, slow down, or stop in their tracks. That's the physics. That said, here's how it translates to F. laciniata, a living being: the capability of iridescence is due to gland cells located within the surface layer of the skin (cuticle). It is here that physics meets biology. Light is reflected and refracted off of the multi-layered cuticle as follows. Some incoming light (yes, even at 100 feet deep) strikes the alga's shiny upper surface while some light penetrates into the alga's deeper layers. Traveling into denser material slows down the light. Traveling deeper than the cuticle's thinness allows the light to reach the bottom surface and reflect back to the upper surface (as opposed to being completely absorbed). When the light taking the longer journey to the bottom surface meets up with the light taking a quick jaunt into the upper surface, the two light waves are now out of synch. The result is brilliant color. Exactly what color will be the outcome depends on the cuticle's thickness and the angle of natural light. 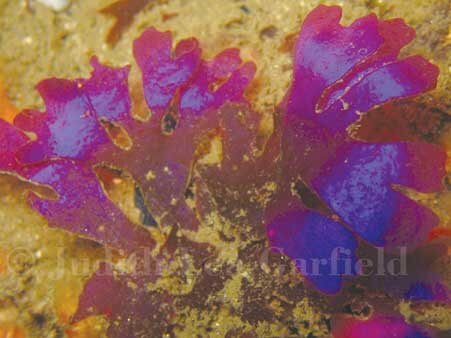 In this case, the end product is a glorious iridescent blue-violet that overlays areas of the deep-red alga. Though F. laciniata is studded with special gland cells, the alga would not be able to shine without light. Let there always be light!